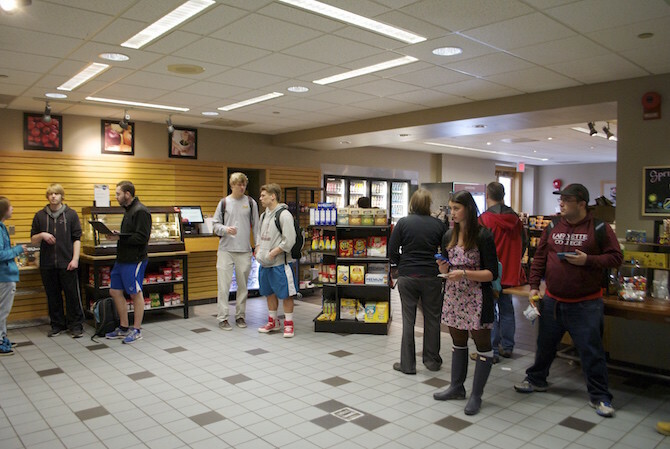 Find out about campus dining before you make your final decision. It’s officially spring again. That means, thousands and thousands of high school seniors are deciding where to go to school for the next four years. If you’re anything like us, food is definitely a factor in this all important decision. From big state universities to smaller liberal arts colleges, these schools can be seen as varied from each other like night and day. What they all have in common, though, is a priority for good eats. While it’s easy to hit up local spots around campus, you may be more curious about what the university itself has to offer in the food department. Luckily for you, we’ve tried to make this choice a little easier by rounding up 36 of the best dining halls in the country. 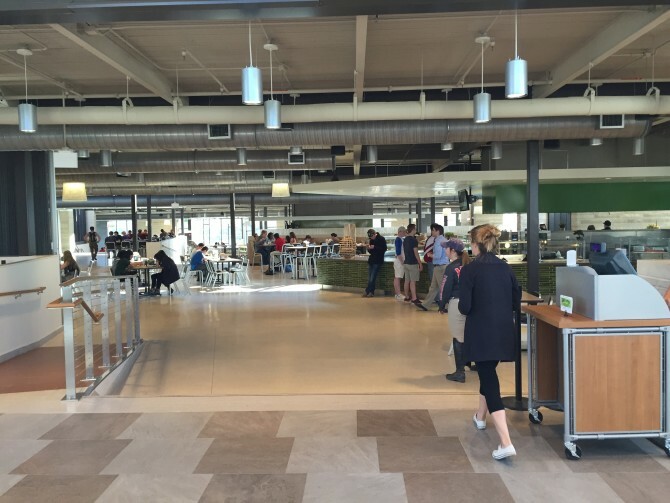 If you’re lookin’ for a campus with decked out meals available just for you, check it out. This modern dining hall boasts a double-decker layout. Embrace the freshman fifteen in this all-you-can-eat dining option with BU’s dining points or cash. According to students, this is the best dining hall option at BU. 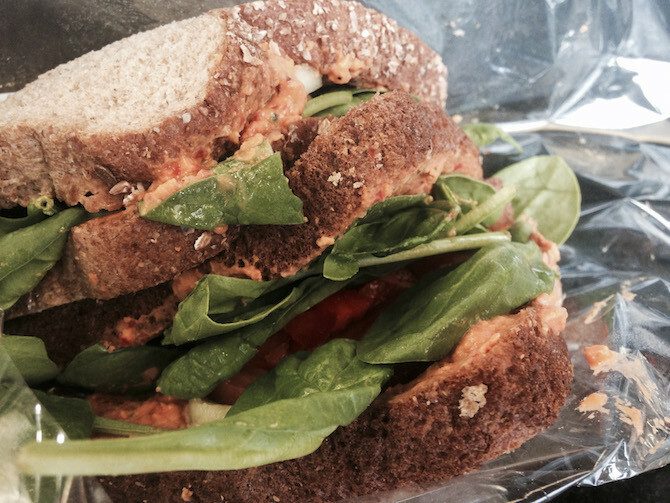 Get your grill cravings satisfied or find your vegan/gluten-free necessities at the Rise Café in the basement. Sample menu: Seafood Cioppino, Chili Bean Tostada Braised Chicken Taco, Grilled Lemon Brined Pork Chop, Mahi-Mahi Fish Taco, Shrimp Louis Salad, Jack in the Box Burger, California Strawberry Cheesecake, CPK California Club Pizza. Thanks to Rachel DeSimone, Editor-in-Chief of Boston University Spoon. Students at Brandeis absolutely love Lower Usdan. From the Garden Bar with a great amount of ingredients to make your own perfect salad, to the Usdan diner with dishes like hamburgers, cheese quesadillas, and french fries—you can definitely find what you’re looking for here. Sample menu: Tabouleh salad, Hummus, Jerk Chicken Thighs, Steamed Brown Rice, Vegetable Pakoras, Grilled Balsamic Fresh Eggplant, Zucchini & Yellow Squash, Sundried Tomato & Feta Pizza. Thanks to Editor-in-Chief Niki Laskaris of Brandeis Spoon. 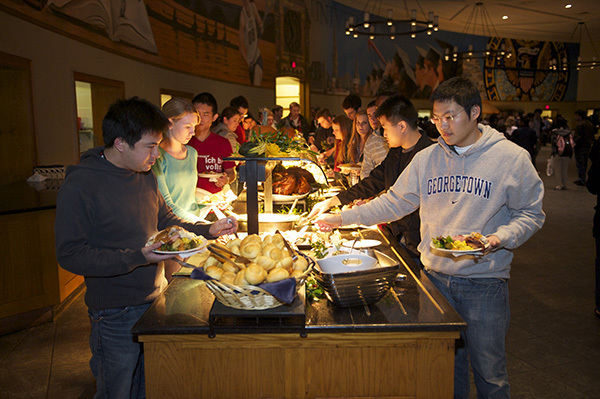 This buffet-style dining hall is the claim to Freshman 15 for Bucknell students. Stations like Egg Bar, Fresh Stock (soup station), Main Street Grille, Route 15 (comfort food), University Deli, Pizza + Pasta, Dessert, Whole Body (vegan and vegetarian station), and Mongo Fresh (Mongolian BBQ/stir fry station) have students lining up for more. Sample menu: Mushroom Swiss Burger, Baked Potato Bar, Fried Cauliflower, Sweet Potato Fries, Chicken Noodle Soup, Butternut Squash Bisque Soup, Jamaican Jerk Chicken, Beef & Cheesy Mac Casserole, Fresh Mixed Vegetables, Roasted Sweet Potatoes, Adobe Roast Pork. Thanks to Editor-in-Chief Dannah Strauss of Bucknell Spoon. 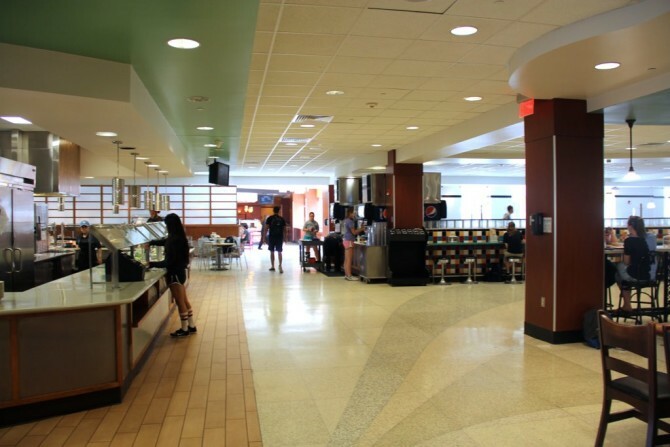 Ferris Dining Hall has the classic student necessities like pizza, pasta and salad bar, paninis, cereal, a beligan waffle maker, and a daily hot food station. Sample menu: French Toast, Homestyle Oatmeal, Scrambled Eggs, Breakfast Potatoes, Breakfast Ham, Turkey Sausage, Ham and Potato Frittata, Vegan Mushroom & Garlic Pizza, Mexican Pizza, Meatball Hero, Chicken Noodle Soup, Cream of Broccoli Soup, Chicken Quesadilla, Roasted Salmon. Thanks to Editor-in-Chief Isabel Steckel of Columbia Spoon. Located in Becker Hall, this Cornell dining experience boasts freshly baked calzones, sushi, and guacamole. There’s also varied theme nights, including: Asian, Mexican, and Italian. Oh, and there’s Sunday Brunch, too. Sample menu: Becker Omelet Bar, Becker Fresh Squeezed Orange Juice, French Toast, Home Fried Potatoes, Vegetable Soup, Cornell Chicken & Rice Soup, Miso Vegetable Soup with Udon Noodles, Pork Sausage Link, Black Beans & Rice, Scrambled Eggs, Fresh Zucchini, Chicken Breast Sandwich, Grilled Turkey Burger, Fried Fish Sandwich, Veggie Burger, Assorted Salad Selections, Greek Style Yogurt, Dim Sum, Roasted Pork Loin, Pasta Bake Vegetable, Becker Boneless Jumbo Chicken Wings, Koko’s Sesame Broccoli & Tofu, Baked Potato Bar. Thanks to Editor-in-Chief Katherine Carroll of Cornell Spoon. 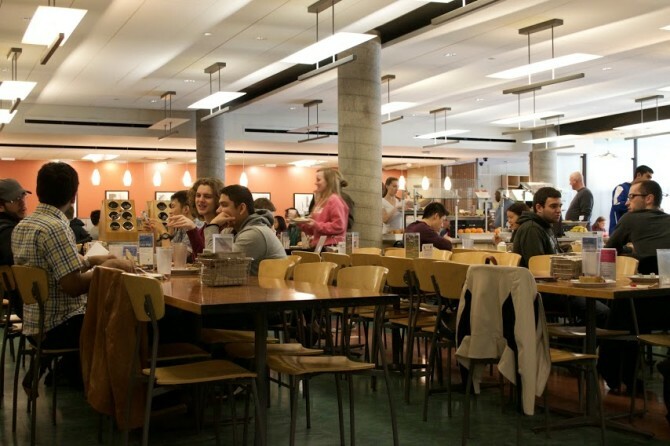 Dartmouth students and locals alike flock to Collis Café for many of their meals. A central hub for social meet-ups and club meetings, Collis Café offers breakfast, lunch, and dinner. For breakfast, there is a made-to-order omelet and egg bar, smoothie bar, and oatmeal bar. The lunch offerings include a made-to-order stir-fry, omelet and egg bar, daily lunch special, soup bar, pre-made sandwiches and sushi, made-to-order sandwich bar, salad bar, and smoothie bar. Collis Café dinner has a stir-fry, made-to-order pasta bar, soups, sandwiches, salad, sushi, smoothies, and drinks. There is also a baked good section with vegan and gluten-free treats. Collis has “Late Night Collis” seven days a week, offering mozzarella sticks, chicken nuggets, cinnamon rolls, and crêpes (to name a few!). Sample menu: Thai Chicken Noodle Soup, Split Pea Soup, Vegan Baked Penne, Chicken Florentine Soup, Indian Red Bean & Curry, Singapore Street Noodles, Cheddar Ale Soup, Roasted Chicken Thighs, White Chicken Chili, Eggplant Curry, Seafood Chowder, Shepard’s Pie. Thanks to Editor-in-Chief Tarika Narain of Dartmouth College Spoon. This newly renovated all-you-can-eat dining hall has students flocking to it due to a variety of dining choices and late-night hours during the school week. 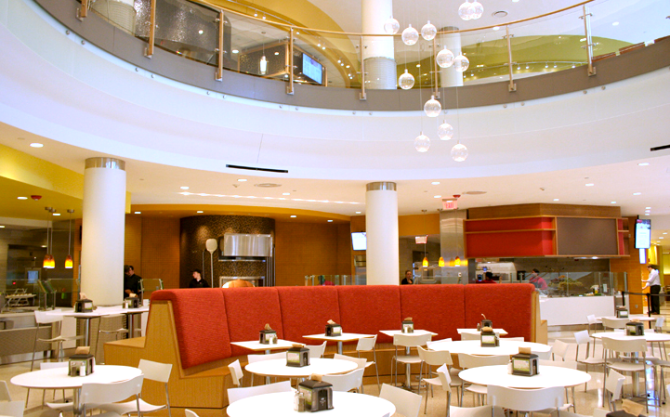 Some student favorites at North Avenue Dining are the Wok station and noodles. Sample menu: Potato Leek Soup, Sweet Potato and Black Bean Chili, Herb Seasoned Breadsticks, Hamburger, Classic Cheeseburger on a Toasted Bun, Cheese Quesadilla, French Fries, Carrot & Celery Sticks, Grilled Vegetable Reuben Sandwich, Herb Roasted Turkey Breast, Spicy Hummus, Quinoa with Squash. Thanks to Editor-in-Chief Tessa Powers of Georgia Institute of Technology Spoon. Featuring both a formal dining experience on the main floor and casual dining experience downstairs, Leo’s has many options for students. 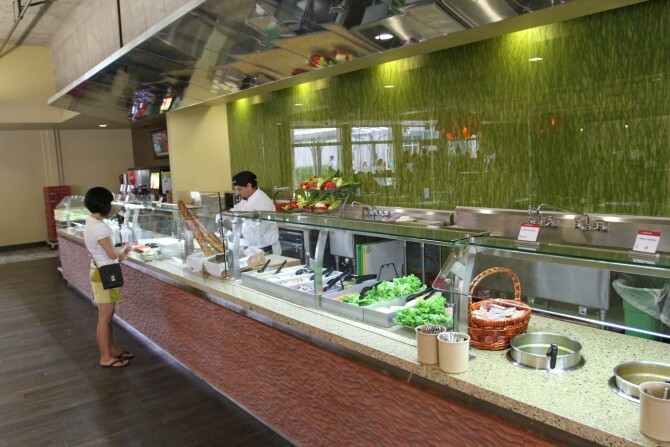 The ground floor offers a salad bar, pasta station, vegetarian/vegan station, “home” station, burrito station, wok station, and sandwich station. The downstairs has a smaller salad and sandwich bar, pizza bar, grill, desserts, and fruit. Sample menu: Scrambled Eggs, Pancakes, French Toast, Tater Tots, Pasta with Marinara Sauce, Three Cheese Pasta, Steaka, Chicken, Fish, Steamed Vegetables, Grilled Cheese, Hamburger, Chocolate Chip Cookies, Sugar Cookies, Oatmeal Raisin Cookies, Ice Cream. Thanks to Editor-in-Chief Victoria Goodell of Georgetown Spoon. Get ready, foodies. This dining hall is operated by Bon Appètit. We know, we’re jealous too. The FFC has shown a continued commitment to locally sourced foods and environmentally beneficial causes like Meatless Mondays. 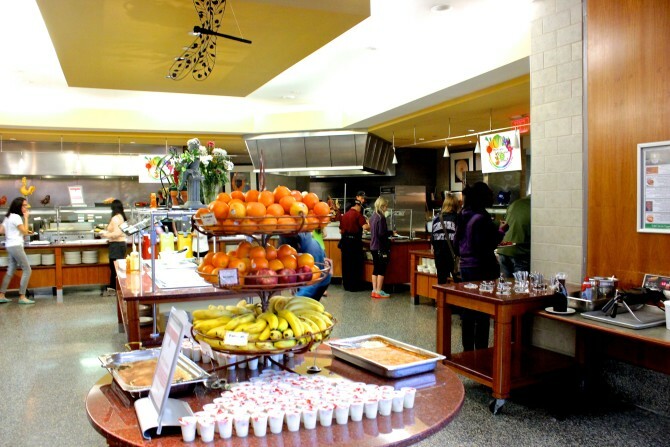 The FFC has typical dining hall foods like chicken, burgers, pizza, bagels, salad bar, etc. Another feature of the dining hall is their sandwiches and paninis of the week. They also have a station that changes bi-weekly that offers either Japanese stir fry, Mongolian barbecue, quesadillas, and macaroni and cheese. Sample menu: Cage Free Scrambled Eggs, Red Bliss Homefries, Grilled Canadian Bacon, Country Biscuits & Sausage Gravy, Whole Grain Pancakes, Indian Harvest Breakfast Cereal, Pastrami Crusted Roasted Turkey Breast, Omelets Made-to-Order, Sauteed Beets, Lemon Caper Chicken, Saffron Risotto, Steamed Broccolini with Lemon, Crepes with Goat Cheese and Grilled Vegetables. Thanks to Editor-in-Chief Keri Gawlik of Johns Hopkins Spoon. Pre-packaged meals or made-to-order: Lower Farinon’s got the goods. Be it breakfast foods, sandwiches, or pasta—you can find it here. Fresh made sushi is “Lower’s” newest addition. Thanks to Editor-in-Chief Katie McGuire of Lafayette Spoon. 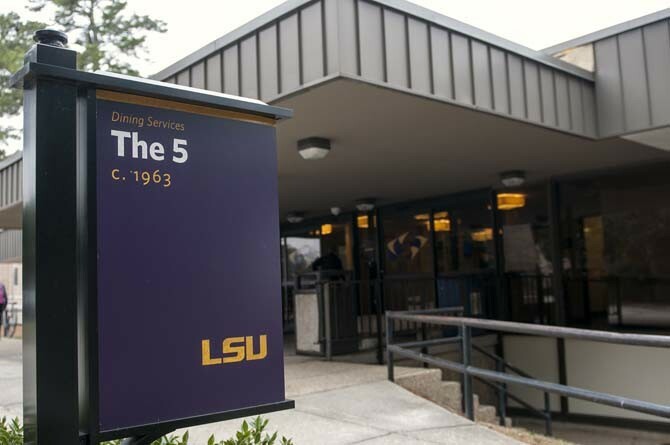 LSU’s dining hall, The 5, offers varied stations like a salad bar, coffee bar, pizza, pasta dishes, and soft-serve ice cream. The 5 has a store open late at night with chocolate, potato chips, Papa Johns pizza, and Krispy Kreme donuts. Sample menu: Scrambled eggs, Crispy Hashbrowns, Grits, Old-Fashioned Oatmeal, Country Ham, Biscuits, Cinnamon French Toast, Egg Omelet, Breakfast Burrito, Blueberry Scone, Deli Turkey Breast, Tuna Salad, Homemade Potato Chips, Baked Chicken Tenders, Pork Lo Mein, Southwest Lasagna Roll, Beef & Broccoli Stir-Fry with Brown Rice, Cream of Red Pepper Soup. Thanks to Editor-in-Chief Laura Smith of Louisiana State University Spoon. Redone a couple years ago, Locke’s Loft is Manhattan College’s dining hall with seemingly endless amounts of stations. There’s the Brick Oven Pizza, Exhibition Station (feature meal cooked right in front of you), Waffle Station, Hydration Station, Mom’s Kitchen (a do-it yourself station), Very Vegan, Allergy-Free Zone, Bread & Breakfast, Baked to Perfection (baked goods), Chef’s Choice Main Entrees, Carvery, Grilled to Perfection, Deli Delectable, Salad Bar, Health & You, Beverage, and Sweet Dreams. Sample menu: Meat Lasagna, Grilled Chicken with Roast Tomato, Caramelized Onions, and Basil, Creamy Parmesan Polenta, Sautéed Broccoli Rabe with Garlic & Oil, Fingerling Potatoes with Rosemary & Garlic, Dumpling Bar, Chicken Dumplings, Shrimp Dumplings, Vegetable Dumplings, Spicy Black Bean Burger. Thanks to Editor-in-Chief Alyssa Rosello of Manhattan College Spoon. If you’ve ever wanted to live out your dream of attending Hogwarts, this is your chance. 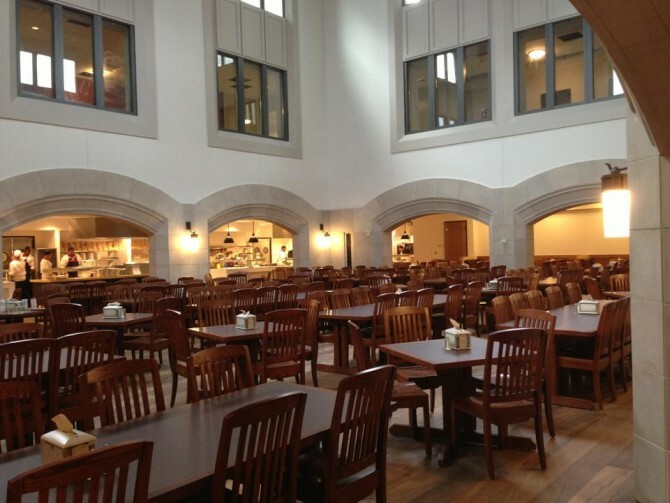 Described by Marist students as “basically one and the same” as the Great Hall, this Dining Hall (yes, it’s called that), features fresh made sushi, a rotisserie station, and salad bar. Another all-you-can-eat with communal long, wooden tables to make you feel at home away from home. Sample menu: Southwest Seasoned Rotisserie Chicken, Roasted Veggie Caesar Petite Wrap, Yankee Pot Roast, Oven Roast Rosemary Red Potatoes, Classic Cheeseburger on a Toasted Bun, Zesty Black Bean Gardenburger, Pepperoni Snowshoe Pizza, Indian Slaw, Steve’s Cape Cod Clam Chowda’, Peanut Butter Cookies, Chocolate Banana Bread Pudding. Thanks to Rachel Pfister and Editor-in-Chief Mikal Post of Marist College Spoon. Stations on stations on stations. Western Dining Commons has got it. Grill & Roast Station has the locally sourced meats and a variety of fish and poultry. The International Station features cuisine from around the world. The Salad & Deli Station”s salad bar offers over 50 toppings. The Allergen Free Station is for those with common allergies: this station does not include dairy, eggs, peanuts, tree nuts, fish, shellfish, soy, wheat, and gluten. Sample menu: Chicken Caesar Flatbread, Deluxe Club Sandwich, Fresh Mozzarella Sandwich, Geneva Turkey Flatbread, Bacon Egg and Cheese, Sausage Egg and Cheese, Egg and Cheese, Jalapeño Kettle Chips, Cinnamon Raisin Bagel, Blueberry Bagel, Chocolate Croissant, Grilled Chicken Breast Sandwich. Thanks to Editor-in-Chief Molly Barreca of Miami University Spoon. 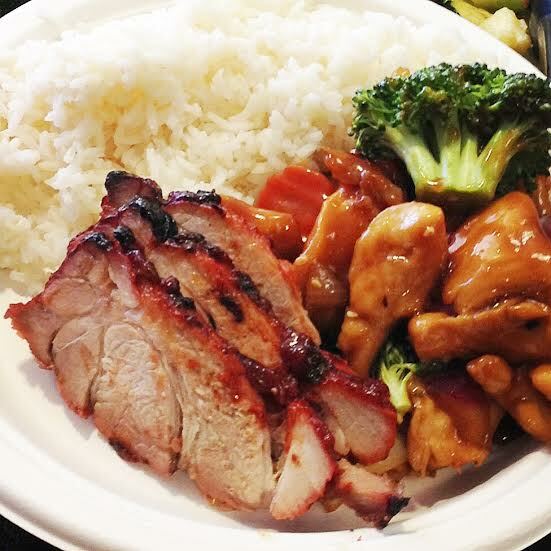 Located in Pepperdine’s Villa Graziadio, the Drescher Café not only has Chinese eats like Teriyaki chicken, sweet and sour tofu, and beef broccoli stir fry, but it also overlooks the Pacific Ocean. The dining hall has several stations, including: Udon Noodle Bar, Asian Stir Fry, Grill, Pizza, Soups & Salads, and Simple to Go & Bakery. Sample menu: Breakfast Quesadilla, Breakfast Burrito, Croissant Breakfast Sandwich, Texas French Toast, Omelet, Pancakes, Char Grilled Angus Bacon Cheeseburger 1/3 lb, Grilled Chicken Breast with Smoked Gouda, Turkey Burger, Chicken Tenders, Pizza, Egg Rolls, Stir Fry. Thanks to Editor-in-Chief Denisse Cristina of Pepperdine Spoon. Students at Queen’s University love Leonard Hall. 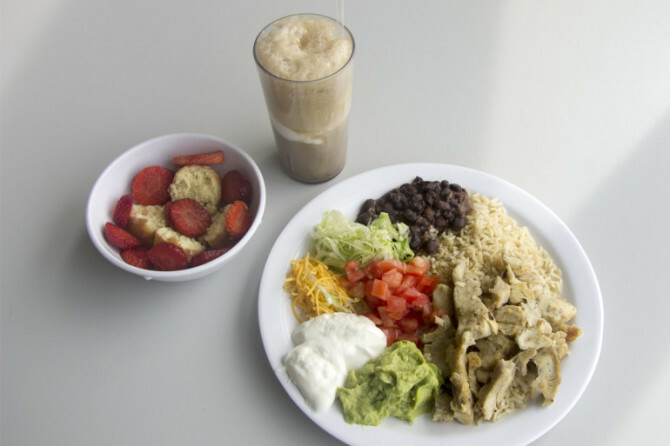 Salad bar, soup bar, and many meat and vegetarian meal options have students choosing Leonard Hall as their eating destination. Thanks to Editor-in-Chief Rebecca Alter of Queen’s University Spoon. 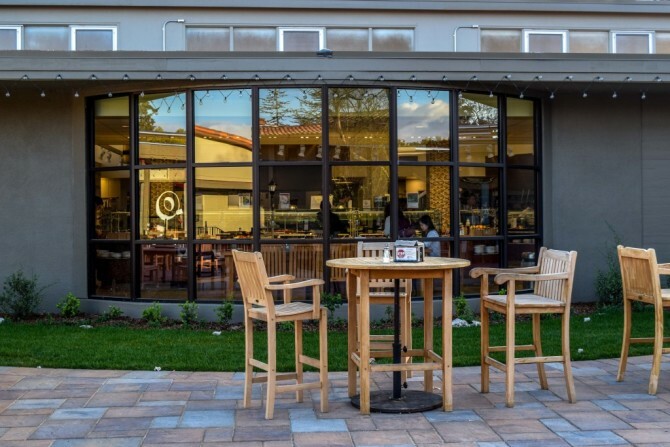 Florence Moore Dining, or as the cool kids call it, “FloMo,” is one of Stanford’s most prized dining options. 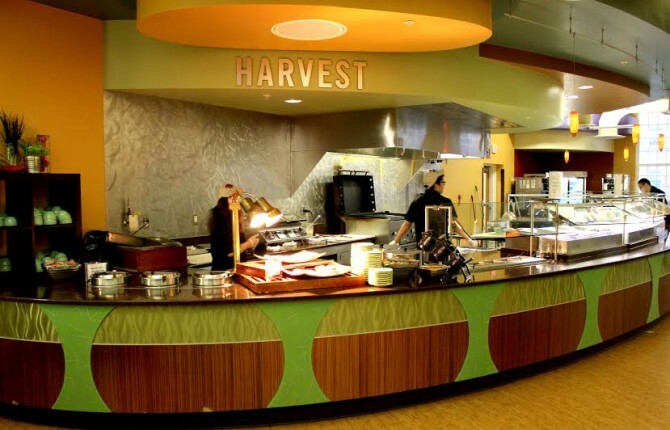 With features like Sunday night Indian, a hand serve ice cream bar for every meal (with flavors like coffee, mint chocolate chip, and toffee crunch), a salad bar, and a unique Kosher Dining Pilot Program—this dining hall has everything and more. Sample menu: Quinoa Salad, Lamb Meatballs with Thai Coconut Curry Sauce, Chicken Lemon Soup, Greek Salad, Falafel Station, Saffron Basmati Rice, Roasted Cauliflower, Grilled Baby Carrots with Cumin, Lemon, Greek Yogurt and Honey Chile Oil, Roasted Cherry and Balsamic Onion Flatbread Pizza, Stuffed Portobello with Spicy Yellow Lentils. Thanks to Editor-in-Chief Grace Goettman of Stanford Spoon. Not only does “FG” support local farmers, but also offers unique options daily (including three different soup options). The sandwich and salad stations stay the same. Sample menu: BBQ Pulled Pork, Sandwiches with Coleslaw, Sautéed Swiss Chard with Apples, Sautéed Green Beans, Roasted Cauliflower Soup, Mexican Pork Stew, Coconut Chicken Curry Soup. Thanks to Editor-in-Chief Carla Velarde of St. Louis University Spoon. Named after Syracuse’s star football player and first African-American to win the Heisman Trophy, Ernie Davis Hall is a student favorite. This dining hall includes a salad bar, Sbarro pizza, wrap and sandwich bar, vegan and gluten free stations, and an entree station. 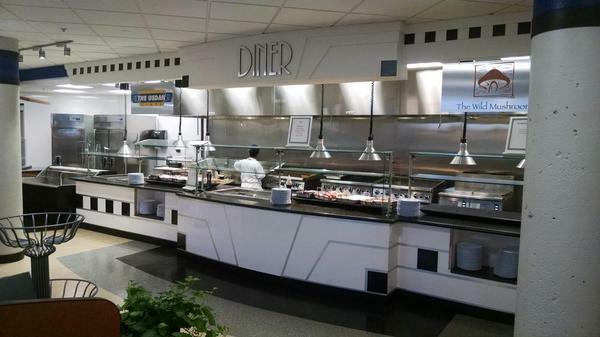 Ernie Davis hall boasts a hot-entree bar with stir fry, make-your-own pasta and omelets, too. Sample menu: Vegan Grits, Assorted Donuts and Muffins, Vegetarian Biscuits, Home Fries, Vegan Banana French Toast, Grilled Roast Beef Sandwich, Roasted Garlic Hummus, Penne Pasta, Cupcakes, Pork & Shrimp Egg Roll, BBQ Chicken, Sweet Potatoes, Thai Crispy Chicken, Carved Ham, Pumpkin Crunch Cake, Banana Oatmeal Cookie. Hours of operation: Mon-Fri: 7 am-10 am, 11 am-3 pm, 4:30 pm-9 pm; Sat-Sun: 9 am-10 am, 11 am-3 pm, 4:30 pm-9 pm. Thanks to Editor-in-Chief Alexa O’Connell of Syracuse Spoon. This TAMU dining hall is one of the biggest in the country. It features an underground food court that has Smoothie King, Smash Burger, and Einstein Bros. Bagels. There’s even a “scramblet” bar that combines scrambled eggs and omelets. Sample menu: Blueberry Muffin, Banana Muffin, Apple Turnover, Scrambled Eggs, Old-Fashioned Oatmeal, Vegetarian Western Omelet, Chocolate Chip Pancakes, Jasmine Rice, Lemon Pepper White Fish, Pepperoni Pizza Flatbread, Grilled Chicken Breast, Chicken Fried Steak, Southwest Beef Taco, Carne Asada Taco, Stuffed Shells Florentine, Bread Pudding, Brownies. Hours of operation: Mon-Fri: 7 am-2 pm, 5 pm-8 pm; Sat: 10 am-2 pm, 5 pm-8 pm; Sun: 11 am-3 pm, 5 pm-8 pm. Thanks to Editor-in-Chief Lauren Kitto of Texas A&M Spoon. 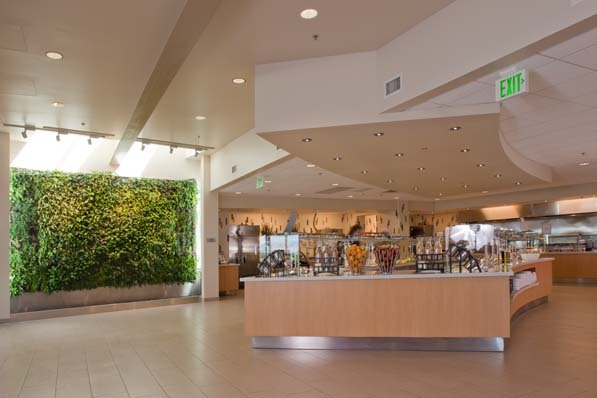 This new dining hall at UCLA, nicknamed “BPlate,” focuses on providing healthy and sustainable options for students. With calming music to accompany the local produce, organic, vegetarian, and vegan options, this dining hall is perfect for that California-cool vibe. Student favorites here include the salad bar, flatbread pizzas, salmon, and tilapia. BPlate is all-you-can-eat for one swipe off the Bruincard. Sample menu: Basil-Oregano Chicken with Rice, Kale, & Beans, Grilled Pork Loin Chop with Squash & Pears, Mixed Vegetable Flatbread, Autumn Farro Salad, Tumbled Greens Salad, Key Lime Pie Mignardise. Thanks to Editor-in-Chief Madison Craig of University of California Los Angeles Spoon. Look no further for UChicago’s dining hall superstar. Bartlett’s got a lot to offer in its stations: Deli, Euro, Global, Gluten Free, Grill, Halal, Harvest, Kosher, Pizza, Salad, Soup, and Sweets. Sample menu: Garlic Potato Chips, B.L.T., Rigatoni & Meatball Casserole, Chimichurri Beef Steak, Garlic Toast, Shrimp Pad Thai, Spicy Orange Chicken with Broccoli, Salsa Cheddar Quesadilla, Twister Fries, Gardenburger, Grilled Herb Chicken Sandwich, Hamburger, Black Bean Cakes, Crispy Zucchini, Baked Sweet Potato, Hearty Chicken Gumbo. Thanks to Editor-in-Chief Tiffany Chen of University of Chicago Spoon. This buffet-style dining hall is a student favorite due to its small and cozy, yet sophisticated atmosphere (completed with classic-looking wooden chairs and surrounding windows), and its hard to beat comfort food. 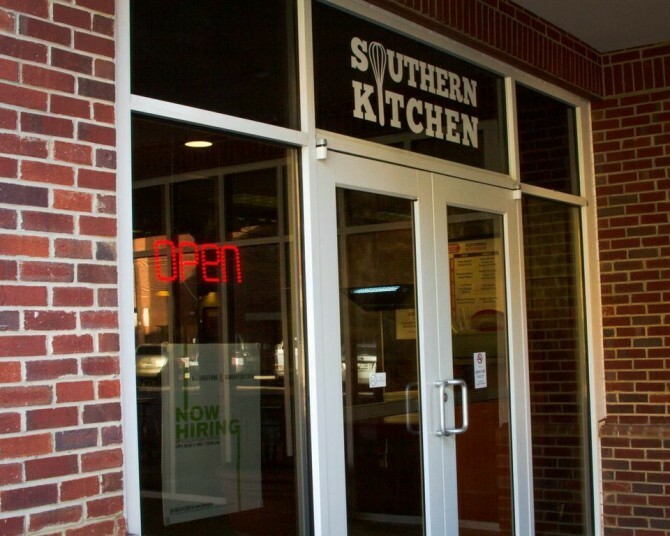 Whether you want to build your own mac n cheese, or you’re feelin’ for some soup, this campus eatery has just what you need to fuel your finals struggles. Sample menu: Jerk Chicken Soup, Broccoli Cheddar Soup, Crispy Chicken Nuggets, Vegan Nugget with Sesame, Seasoned Couscous, Le Mac (build your own mac n cheese station), Grilled Turkey Cutlet with Bruschetta, Pesto Orzo, Cheese Pizza, Mediterranean Chicken Panini, Asian Edamame Salad, Cinnamon Sugar Cookie, Chocolate Cake with Peanut Butter Mousse. Thanks to Alison Sprong and Editor-in-Chief Rachael Piorko of University of Delaware Spoon. 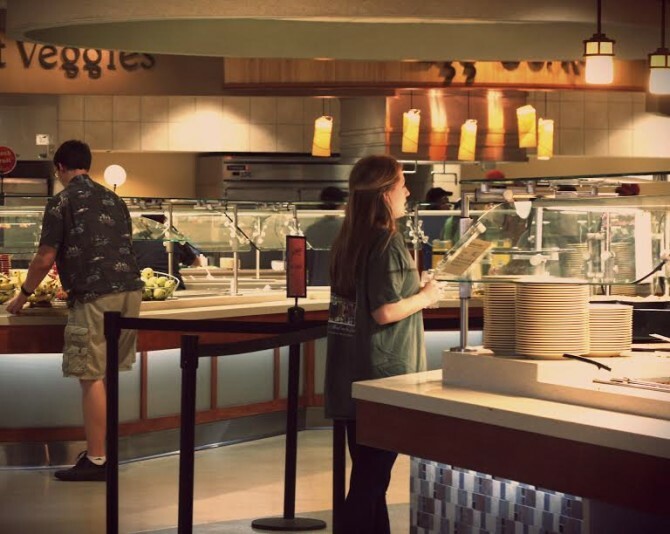 Village Summit, or as students nickname it, ECV, has some of the best eats on the UGA campus. 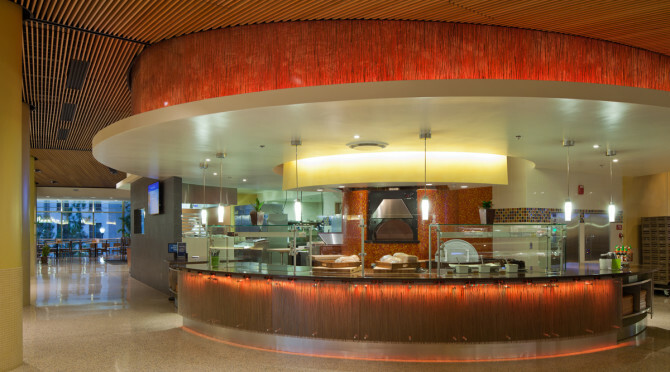 ECV boasts personal pizzas, specialty salads, bread bowls, deli and omelet stations, and vegetarian options, too. Sample menu: Apricot Medallion Danish, Blueberry Oatmeal Muffin, Peanut Butter Cookies, Buffalo Ranch Pizza, Cheese Manicotti in Spicy Italian Sauce, Whole Wheat Pasta of the Day, Southern Fried Chicken, Tilapia with Parmesan & Dill, Brown Gravy, Fried Okra, Seven Bean Medley Soup, Cream of Mushroom Soup. Thanks to Editor-in-Chief Mollie Simon of University of Georgia Spoon. 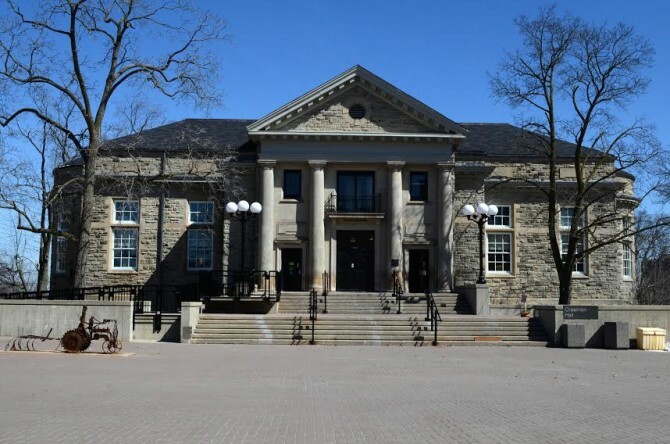 With freshly made food as you order, Creelman Hall takes the prize for best dining hall at the University of Guelph. 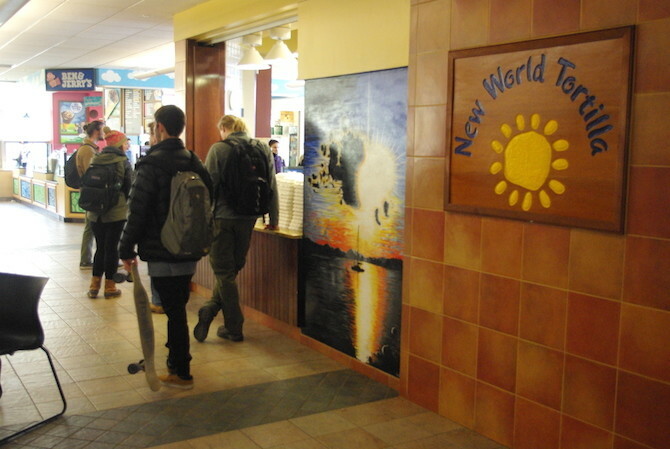 All foods at Creelman Hall are locally sourced, and there are special theme weeks every week. Sample menu: Seven Bean Casserole, Perogies with Onions, Grilled Chicken with Tropical Salsa, Lamb Korma, Steak Caesar, Kale & Quinoa Dolmades, Argentine Lentil Stew, Maple Mustard Roast, Lamb, BBQ Chicken Wings, Chicken Supreme. Thanks to Editor-in-Cheif Joey Tang of University of Guelph Spoon. 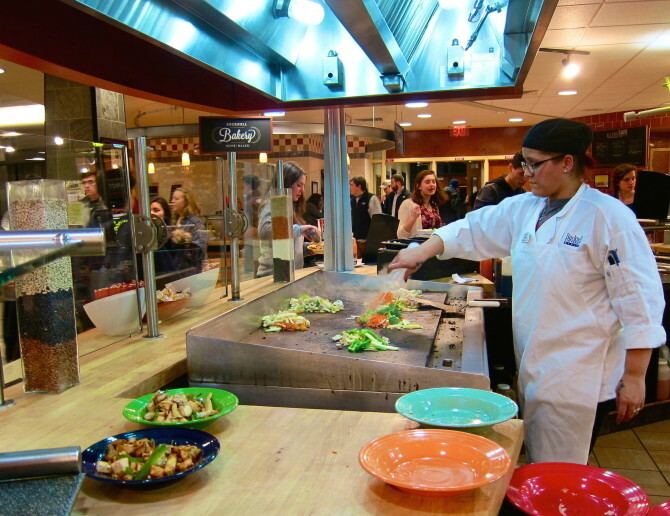 This all-you-can-eat dining hall has a variety of dining stations: Italian, Veggies and Soup, Grilled, and Chef’s Table. One of the most impressive things about 251 North is its sustainability efforts—all food in this dining hall is found sustainably. Sample menu: Vegetarian Miso and Chicken Broths, Ramen Noodles and Sticky Rice, Teriyaki Stir Fry Vegetables, Pork Pot Stockers, Spring Rolls, Tempura Chicken, Spicy Mongolian Grilled Chicken, Foot long Hot Dogs, Roasted Turkey, Sundried Tomato Pesto with Fontina Cheese and Carmelized Onions Grilled Cheese, Swiss Melt with Mushroom Onions and Thousand Island Burger. Thanks to Editor-in-Chief Alex Vu of University of Maryland Spoon. 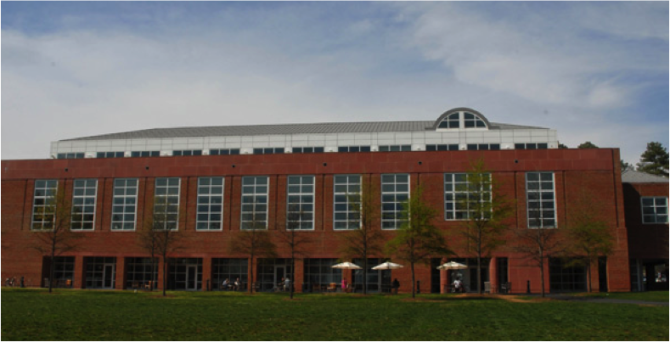 This dining hall open for breakfast, lunch, and dinner, is one of the two dining halls that UNC offers. There’s also a late night option which has breakfast food for students. Ram’s Head has a salad bar, deli bar, pizza and pasta bar, vegetarian/vegan dishes, bakery, grill, and soft serve section. The weekend brunch until 2 pm is a hit among students. Sample menu: Salmon Burger, Crinkle Cut Fries, Cilantro Lime Rice, Cuban Black Bean Soup, BBQ Pinto Beans, Cream of Mushroom Soup, Zucchini and Yellow Squash Pizza, Plain Gluten Free Pasta, Hamburger, Cheeseburger, Grilled Chicken Sandwich, Black Bean Burger. Thanks to Editor-in-Chief Sara Tane of University of North Carolina Spoon. 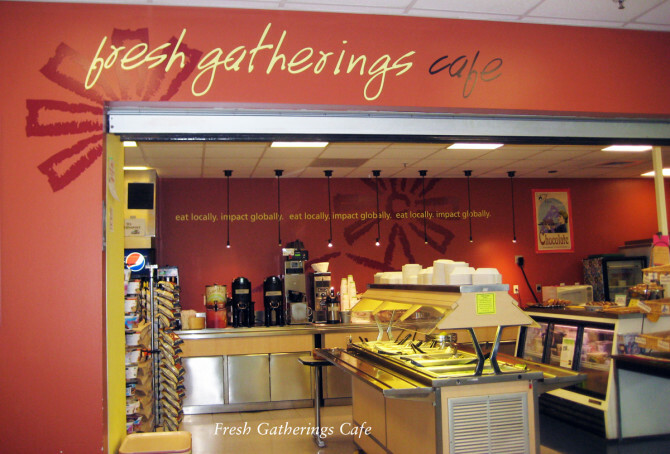 Located in Rochester’s medical center, this café has twelve food stations, including a pasta bar (student pick), deli station, salad bar, and fruit bar. The beloved pasta bar gives students the opportunity to create their pasta meal from different shapes, sauces, meats, and veggies. The Homestyle station has comfort food options, and the dessert bar offers a sweet ending to your meal. This UR dining area accepts Declining Dollars and credit and debit cards. Sample menu: Cinnamon French Toast, Sausage & Biscuits with Gravy, Mexican Breakfast Pizza, Pasta Fagiolo Soup, Neptune’s Crab Bisque, Butternut Squash Soup, Mediterranean Chicken Stromboli, Roasted Corn & Black Bean Wrap, Ham & Dijon Grilled Cheese, Pasta Primavera, Honey Grilled Salmon, Prime Rib, Bourbon Street Pecan Pie. Thanks to Eva Reynolds of University of Rochester Spoon. With a breakfast featuring an omelet station, waffle station, and Krispy Kreme donuts—who wouldn’t want to go to Parkside? There are hot food stations, including burgers, hotdogs, chips, and fries. Parkside also features a vegan/gluten free stand with bread, salads, and pastas. The fruit stand in Parkside has smoothies, juices, and fresh grapefruit. For dessert, Parkside has a frozen yogurt and soft serve vanilla ice cream machine. Additionally, there’s a dessert bar with cakes, pies, cookies, and pastries. Parkside also hosts theme nights, which have exciting meal options for special holidays and events. Past theme nights include: Valentine’s Day, St. Patrick’s Day, Christmas, and Mardis Gras. Sample menu: Fajita Bowl Bar, Chile Lime Tilapia w/ Pico de Gallo, Pork Chile Rojo, Black Bean & Sweet Potato Enchiladas, Pinto Beans, Sautéed Squash Blend, Steamed Chard, Couscous, Pasta Bar, Salad Bar, Deli Bar, Fruit Salad, Jicama, Mango, & Cucumber Salad w/ Chile, Chicken Tortilla, Matzoh Ball Soup. Thanks to Editor-in-Chief Leslie Lee of University of California Spoon. This tastes-like-homemade southern food is exactly what you’re going to be looking for in Tennessee. And UT delivers. This cafeteria-style eatery in Volunteer Hall gives students exactly what they want, and is $8 for a meal. Sample menu: Turkey Meatloaf, Chicken Pot Pie, Chicken and Sausage Jambalaya, Fried Chicken, Cajun Chicken, BBQ Pork. Thanks to Editor-in-Chief Alana Stein of University of Tennessee Spoon. 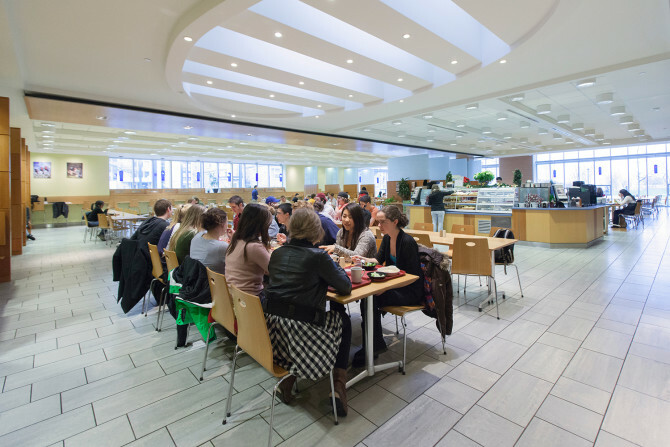 University of Vermont’s dining hall, The Marketplace, is students’ preferred place to hit up for some lunch in between classes. They’ve got sushi, fresh sandwiches, New World Tortilla, and Ben & Jerry’s. Thursday’s must-have is Charlie’s Falafels. Sample menu: Buffalo Chicken Salad with Popcorn Chicken, Carrot, Celery, Cucumbers, and Cabot Cheddar Cheese, Egyptian Red Lentil Wrap with Basmati Rice, Spinach and Feta Cheese, Beef Soft Tacos with Asian Cabbage Salad and Basmati Rice, Green Curry Chicken. Thanks to Editor-in-Chief Camilla Broccolo of University of Vermont Spoon. 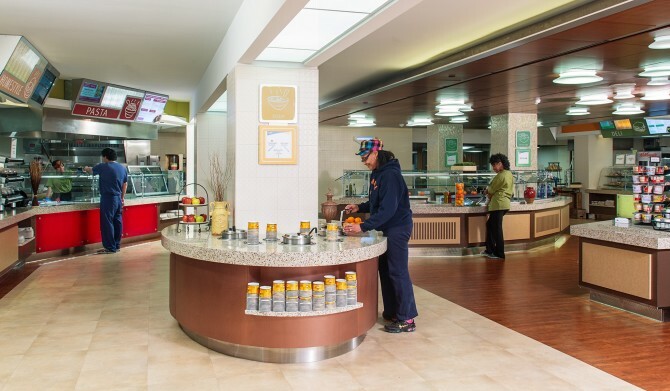 With one swipe to enter, O’Hill has endless food options for UVa students: stir-fry, pizza, hamburgers, sandwiches, vegan and vegetarian dishes, salad bar, and grill. O’Hill has an extensive breakfast selection including omelets, scrambled and hard boiled eggs, bacon, sausage, pancakes, and french toast sticks. There’s also a cereal bar at students’ disposal whenever they would like. Participating in environmental causes, O’Hill has Meatless Mondays. This is their way of taking a stand against the world’s problem of over consuming meat. Sample menu: New York Strip Steak, Fresh Salmon, Ice Cream, Ice Milk (less fattening alternative to ice cream), Thai Salad, Greek Salad. Thanks to Editor-in-Chief Juliet Paterek of University of Virginia Spoon. 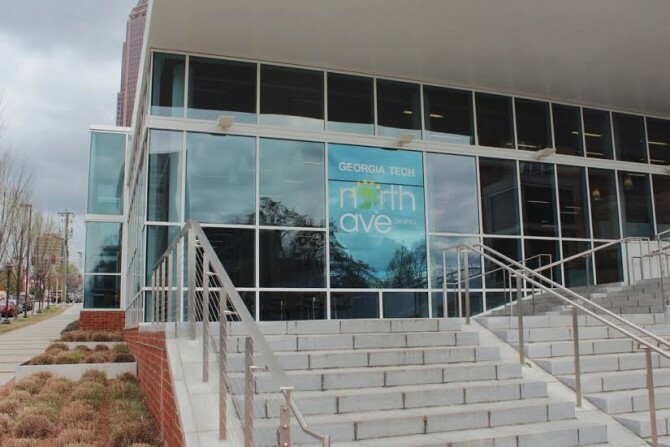 Located in Vanderbilt’s Hillel, this vegetarian and kosher hotspot pronounced “Greens” is a must-try for Vandy students. 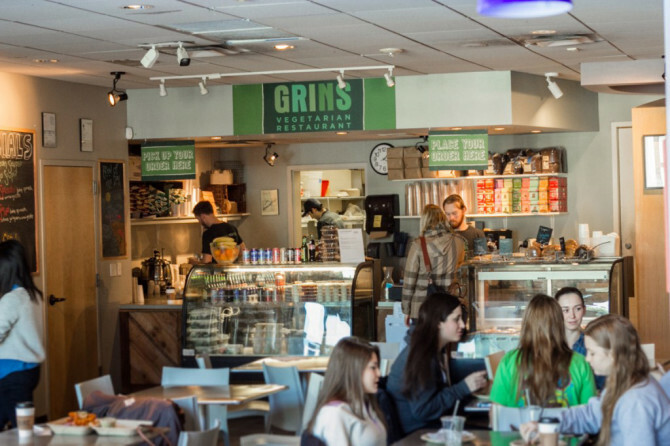 With varying options everyday, you can hit up Grins for a new daily special instead of other routinely dining halls. Entree, side, and drink is one meal swipe. Sample menu: Grilled Cheese (cheddar, roasted garlic mayo, sourdough), Nutella Panini (nutella, strawberry, banana, powdered sugar, multigrain), Strawberry & Yogurt Parfait (honey-flax granola, almonds, vanilla yogurt), Adobo Sweet Potato Tacos (avocado, salsa verde, red cabbage, pickled red onion, cashew-lime crema, grilled soft corn tortillas, served with brown rice). Thanks to Editor-in-Chief Emily Steinberg of Vanderbilt Spoon. Turner Place is Virginia Tech’s dining hall featuring eight restaurants. “Turner” as the students call it, has: Atomic Pizzeria, Jamba Juice, 1872 Fire Grill, Q’doba Mexican Grill, Origami, Soup Garden, Dolci e Caffè, and Bruegger’s Bagels. 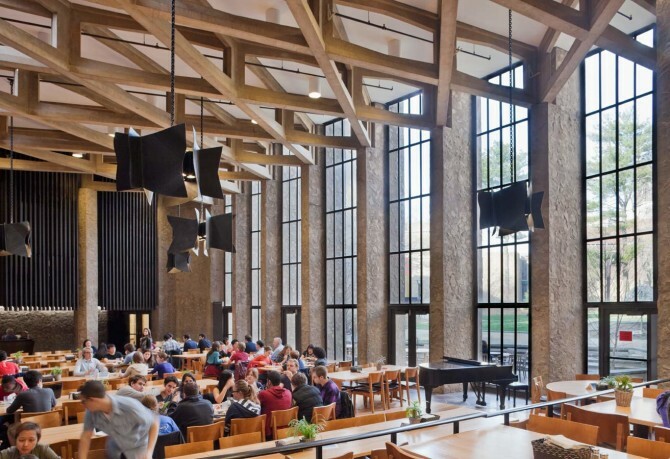 The dining hall was constructed with fostering a community feel in mind. Also, most Virginia Tech dining halls are closed on the weekends to promote students going into Blacksburg to support local eateries. Turner was given a LEED rating, deeming it supportive in environmental efforts. Sample menu: Chicken and Dumplings, Roasted Leg of Lamb, Grilled Flat Iron Steak, Grilled NY Strip Steak, Grilled Thai Peanut Chicken, Chicken Pesto Sub, Eggplant Parmesan Sub, Meat Lover’s Sourdough Pizza, Mushroom & Onion Sourdough Pizza. Thanks to Editor-in-Chief Courtney Duke of Virginia Tech Spoon. 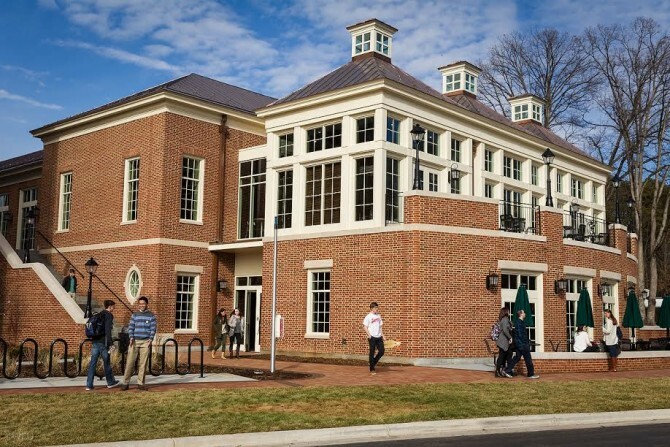 The North Dining Hall, or “New Pit,” is the healthier option of two Wake Forest University dining halls (the other being The South Dining Hall, or “Old Pit”). Healthier options at New Pit include limiting filling your plate just once (per meal swipe). There are muffins, fruit, a salad bar and grill, steak, stir fry, mac n’ cheese, sandwiches, cold pasta, and mixed salads. The outdoor seating is a plus for students, too. Sample menu: Scrambled Eggs, Fresh Homestyle Waffles, Cranberry Orange Muffins, Mediterranean Beef Mini Wraps, Chicken Salad Ciabatta, Vietnamese Rice Noodle Salad, Toasted Sunflower Seeds, Vanilla Yogurt, Lentil Bean Salad, Grilled Montreal Chicken, Chicken Guacamole Wrap. Thanks to Editor-in-Chief Taylor Olson of Wake Forest University Spoon. 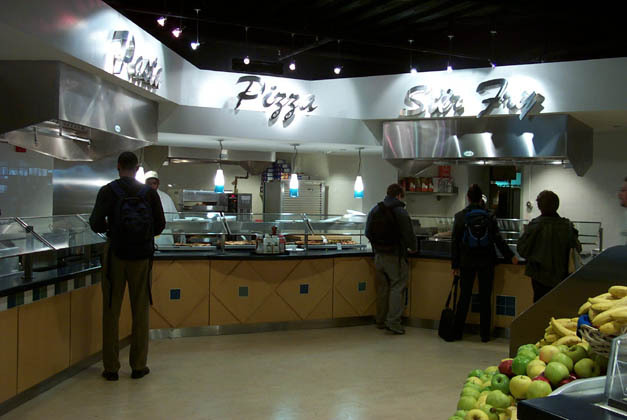 These two dining halls share a kitchen and a wood-fired oven that makes pizza students would pay for. That’s saying quite a lot coming from broke college kids. There’s also other options, like stir fry, noodle bowls, and french fries. Students also love the homemade greek yogurt offered during weekend brunch. Sample menu (same for both halls): Raspberry Oat Tea Bread, Barbecued Picnic Chicken, Greek Bean Salad, Roasted Sweet Potatoes, Roasted Asparagus, Super Fudge Brownies, Yale Cheeseburger, Shoestring French Fries, Cheese Pizza, Ham Pizza, Broccoli Pizza, Mustard-Parmesan Breaded Chicken, Mushroom Ravioli with Sage Butter Sauce. Thanks to Editor-in-Chief Sarah Strong of Yale University. 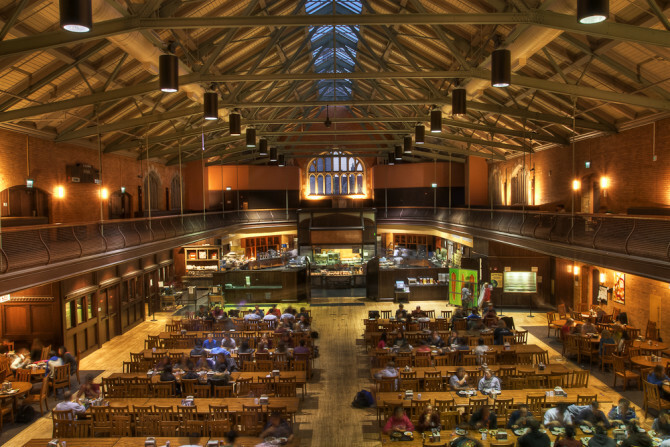 QUIZ: What Kind of Person Are You in the Dining Hall?